Agilent Technologies Inc. (NYSE: A) today announced that its EXA signal analyzer is now the industry's most cost-effective millimeter-wave signal analyzer, covering frequencies up to 44 GHz. With external mixing, it can cover up to 325 GHz. The result is easier, more accurate millimeter-wave measurements. The need to test and operate systems in the millimeter-wave range continues today. Additionally, the growing demand for higher resolution radar, imaging and sensor systems, along with multi-gigabit wireless and fiber data communications, has fostered increasing interest in high-frequency components and systems. The EXA’s extended capabilities and enhanced performance in millimeter-wave measurements effectively address this need, while offering a lower-cost alternative. Like other Agilent X-Series signal analyzers, the EXA is versatile, expandable, offers the broadest set of measurement applications, and can be easily upgraded. In addition, its portability versus the PXA signal analyzer (16 kg/35 lbs. versus 22 kg/48 lbs.) makes it ideal for millimeter-wave applications in aerospace/defense and wireless communications backhaul. 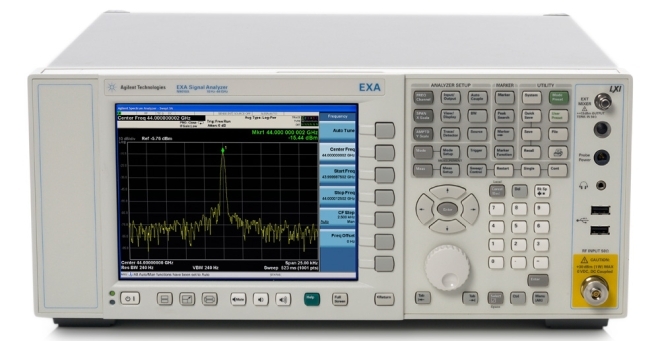 The EXA’s exceptional sensitivity (< –140 dBm/Hz across the V-band with Agilent’s smart harmonic mixers) enables accurate measurement of spurs and harmonics. Along with its excellent phase-noise performance (-106 dBc/Hz typical at 10 kHz offset, 1 GHz carrier), the EXA is able to meet tighter regulations and test requirements for millimeter-wave device design and performance verification. The EXA is a member of the Agilent X-Series signal analyzers, with frequency coverage from 10 Hz to 44 GHz. The X-Series is an evolutionary approach to signal analysis that spans instruments, measurements and software, including more than 25 industry-leading measurement applications that cover cellular communication, wireless connectivity, digital video and other purposes.